Instead of visiting many of the same websites every day, you can instead take advantage of Really Simple Syndication to gather headlines from those sites and either feed them directly to your computer or app automatically or place them at a website you view online. When someone publishes a story on the internet, the website upon which that story is hosted may "push" that story using Extensible Markup Language. An RSS aggregator — basically, a program or service that reads these RSS XML files — retrieves the latest iteration of the XML file from the RSS source. RSS works on a push/pull logic: The publishing site "pushes" an updated XML file listing the current content in the feed, then a reader or an aggregation service "pulls" that XML file, either when a reader refreshes her feed list, or automatically after a given period of time. Focusing on the content that you want to see, rather than what others think you want to see. No algorithm determines what your feed looks like — you'll get all of it. This feature helps you keep abreast of friends' blogs, so they don't get lost amidst a sea of Facebook updates. Remaining current on high-value but low-traffic providers. Some websites (e.g., podcasts or professional blogs) only push one or two new stories per month. With RSS, you'll see those stories in your reader every time, without having to keep visiting the site hoping for something new. Surfacing headlines that you can drill into, rather than having to load entire stories one by one. Bypassing many sites' paywalls. Quite a few online news sites that limit your "free articles per month" nevertheless push all their content to RSS without any sort of reading-limit or subscription-only barrier. Reducing ads. Because RSS pushes just the content of an XML file, without all the stuff that appears on a webpage, you'll read the story without interruption. Offering a clean version of content that you can share, email, or bookmark for later review. Some providers have wisened up to RSS. The popular Dilbert comic strip, for example, no longer publishes the comic itself in its RSS feed but rather a link to a web version, so you'll see the ads. And some popular talk-radio hosts offer paid RSS links that use a subscription-based key in the RSS feed itself, to unlock premium content. But these approaches are rare. People who run blogs often make their RSS feeds available for people to subscribe. Popular content-management systems like WordPress turn RSS on by default. These solutions don't require any extra time or attention from you, beyond a brief one-time setup, yet they facilitate the spread of your content among readers who still rely more on RSS than on social media to consume their news. To get started, check the documentation for your hosting provider's content-management system. 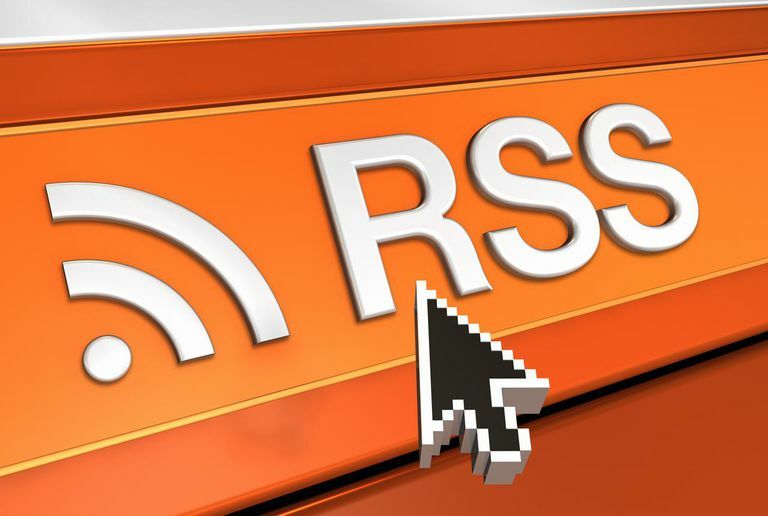 Get started with an RSS feed by downloading an RSS reader (also called an aggregator). Several free and commercial readers, extensions and apps are available online. Download one of these to your computer or mobile device. Go to your favorite websites and look for the RSS link. If you don't see it, type the name of the website plus "RSS" in a search engine. Copy the URL to the RSS feed for the site. Paste the RSS URL into the RSS reader you downloaded. Repeat with all the websites you visit frequently. Customize your RSS feeds so that websites of your choice deliver their latest news directly to your screen. Instead of having to visit 15 different places to get your weather, sports, favorite photos, latest gossip, or latest political debates, you just go to the RSS aggregator and see the highlights of all those websites combined into a single window. The RSS headlines and stories are available immediately. Once published at the source server, RSS headlines take only moments to get to your screen.